Henry Hardinge Menzies was born in Hickory, North Carolina, on April 20, 1928. He received a BA degree from the University of North Carolina (Chapel Hill) in 1948. He did a year of graduate work at the University of Southern California. From 1951 to 1955, he served in the U.S. Navy, eventually becoming a lieutenant in active duty during the Korean War. After the war, he received his degree in architecture from the School of Design at North Carolina State University (Raleigh) in 1958. He began his architecture career working for Perry, Shaw, Hepburn and Dean, Architects, in Boston, Massachusetts. Later, he worked for John M. Gray, Architect, in Boston. In 1962, he founded a firm, The Architects Group, with fellow architects, Vince Solomita and Joe Palermo. From 1964 to 1977, he conducted a private practice in Boston. In 1978, he moved to New York City, forming the partnership of Menzies & LeMieux. He later moved his private practice in 1982 to New Rochelle, New York, where he continues to work today. 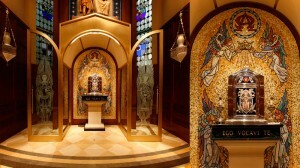 His design efforts have concentrated on church projects, either designing new structures or renovating older buildings. Three of the more outstanding designs have been: The Cathedral of St. Augustine in Bridgeport, Connecticut, St. Aloysius Church in New Canaan, Connecticut, and the chapel of the Heights School in Potomac, Maryland. He has given lectures on church architecture in New York and Connecticut, writing a number of articles on the subject, as well. Most of his architectural work and articles can be seen on his website: www.hmenzies.com. He has been a member of the American Institute of Architects, the Menzies Clan Society, and the Society for Catholic Liturgy. From 1998 until the present, he has been included in the publication: "Who's Who in America." He has held architectural registrations in: Maine, Massachusetts, Vermont, the District of Columbia, Wisconsin, Indiana, Illinois, New York, Texas, and Connecticut. Great article! Thanks for your thoughts, Mr. Menzies! I can appreciate how important it is for people in a church to help support the liturgy through reverence and participation. The architecture is our reminder of the sacredness of the place, and our faithful piety in the liturgy is what activates that it. I’ll never forget attending the canonization mass for St. Josemaria in St. Peter’s Square back in 2002. There were hundreds of thousands of people attending that mass, but at the moment of consecration, there was a profound and astounding silence. It was a very sacred moment which all of us certainly felt and experienced. It’s refreshing to see someone take a stand on Beauty as you have. Modernism has conditioned us into believing it is something relative, ” in the eyes of the beholder”, but of course it’s not as you’ve shown. No one could deny the absolute beauty of the revealing of the snow capped mountain you witnessed. Similar absolute beauty is what our church spaces should convey.Our tradition believes that Beauty,Truth & Goodness are one in the same. Thank you for helping keep that tradtion alive in your architecture & writings. Mr. Menzies puts in such positive terms the need to recover the sacred in liturgy, liturgical music, and liturgical space, as well as in life itself. May this inspire many to implement sacredness wherever it belongs. Three cheers for Mr. Menzies for an outstanding article which dares to go to the roots of sacred architecture. Mr Menzies uniquely exhibits not only a profound depth of liturgical-architectural experience but an uncommon breadth of insight at the nexus of the sacred and the profane, the western tradition and what one might call its “eastern” counterpart, the supernatural and the temporal. Such depth, such breadth form the scope of his work, of equally uncommon dimension as exhibited albeit in small part in this article, a traditional yet modern mimetic of the “living Presence in the tabernacle” whom he consciously positions at the center of his aesthetic with scientific focus to accentuate the action and “argument” of the Mass. Henry Menzies is exactly right, and his powerful message needs to be broadcast widely in our times. The whole perception of beauty–in a sunset or an artwork or a gracious gesture–conveys the sense of a gift. In church design, we give the very best we have in order to thank God for his great gifts to us, especially the breathtaking gift of Himself in the Eucharist. Bravo, Mr. Menzies! You are right on target when you argue that “there is a kind of humility in architecture which does not call attention to itself.” Alas, the lack of humility you refer to is quite noticeable in much of modern art. If the painter, or the performing musician, or the conceptual artist do not have enough “shocking value” then few will pay attention to their creation. This leads a strong bias away from beauty and in favor of calling attention to the artist rather than the higher values art is supposed to reflect. So, to paraphrase your point, there is a kind of humility in art which does not call attention to itself — and certainly not to the artist. In the search of different perspectives about Beauty I found this great article. I liked the analysis that refers to the lost of beauty in some “modern” sacred places. I also agree that reclaiming a sense of the sacred will enhance God´s Glory, as Mr. Menzies points it out. Overall, I found very suggestive insights that may give light to real problems in our society (so distracted by the tumult of human affairs). To rediscover both Beauty (Pulchrum) and Love (Agape, Caritas) through Architecture is an urgent task indeed. Someone who wrote brilliants assays on the Pulchrum, Von Balthasar, asserted that “genuine love between persons is probably much less common than one thinks, although most people think they have had some share in it and that they really possess it for brief moments, it is as rare as great works of art, which tower here and there above the mass of what masquerades as art”. As rare as the reflections found in this article. Thanks.